When it comes to wood stove efficiency that means two things. One is that the stove generates minimal pollutants and conforms to Environmental Protection Agency (EPA) standards. 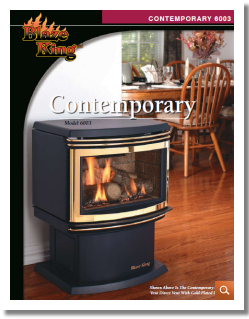 Blaze King wood stoves far exceed EPA requirements. 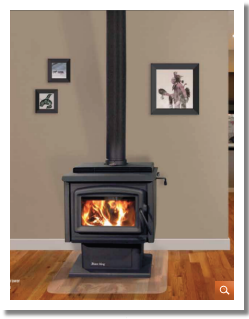 For a wood stove to be truly efficient, it must also burn less fuel and heat for longer. Our wood stoves provide extremely long burn times and phenomenal heat production. 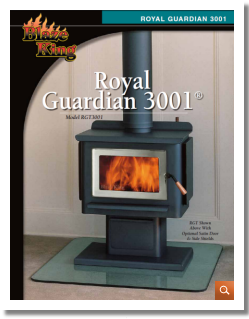 Overall, Blaze King stoves burn up to a third less wood than our competitors stoves and with no heat loss. That means you spend less time, money, and effort chopping, hauling, stacking, moving, and loading wood for your stove. It also means less ash. The superior design and engineering embodied in the Torino produces a supremely clean and attractive burning direct vent appliance suited to even the most difficult installations. Including high altitude applications. With a simple installation of approved venting, you can safely burn either liquid propane or natural gas. 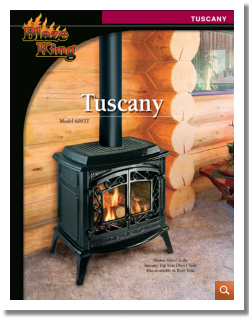 The Tuscany 6003T Casting Elegance and Warmth In your home! With a simple installation of approved venting, you can safely burn either liquid propane or natural gas. The sliding aeration adjustment can even be done while the unit is hot, making fine tuning a snap! Approved for use in any home, including mobile home applications. The Contemporary 6003, the perfect addition to your home heating! With a simple installation of approved venting, you can safely burn either liquid propane or natural gas. The sliding aeration adjustment can even be done while the unit is hot, making fine tuning a snap! Approved for use in any home, including mobile home applications. 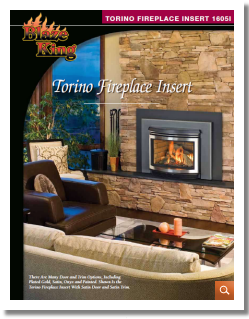 Your Torino Fireplace Insert comes standard with a special halogen light to illuminate the firebox year round. By simply utilizing this special lighting effect, a beautiful glow is cast upon the stunning logs and brick panels. When combined with the Torino's optional Ember Screen as shown below a filtered pattern makes the fireplace even more special in appearance. 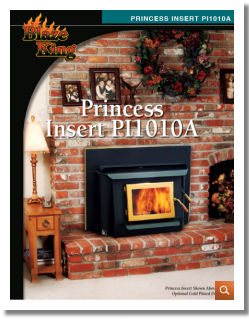 The Princess 1006 is available in Ultra, Parlor and Classic models.Features include a 2.8 cu. ft. fire box and up to 40,000 Btus. The Princess can handle wood up to 16 in length. 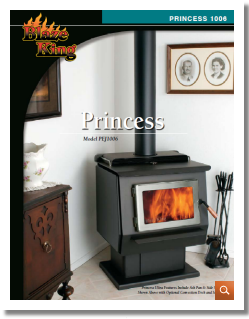 With a 6 flue and optional dual variable speed fans, the Princess is perfect for medium and small homes. Enjoy low burn times up to 20 hours, 82.5% efficiency and EPA emissions of 2.42 gr/hr. Featuring non-catalytic technology, the Briarwood II offers clean burning and an unobstructed view of the fire. 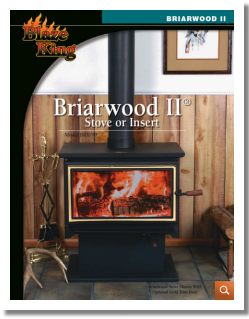 The Briarwood II is designed for easy installation and maximum flexibility in stove placement. The Briarwood stove is approved for both alcove & mobile home installations when properly installed with close clearance kit. You get to decide which is perfect for your home. The more contemporary appearance of the Blaze King Chinook 30 with curved sides or the more classic likeness of the Chinook 30 with flat sides. 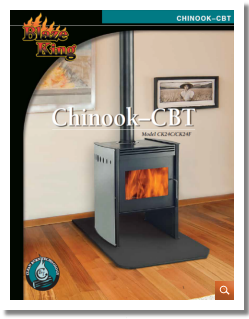 The Chinook 30 (Clean Burn Technology) is our cleanest burning catalytic wood stove and embodies nearly three decades of continuing refinement. 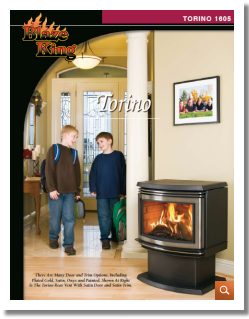 You can customize your Sirocco stove to match the decor of your home. Choose the classic black cast iron door and pedestal with ash pan. Or add brushed nickel highlights to the door, door handle and by-pass handle. For a different look, the Sirocco also comes as a leg model with optional ash pan. Finish your styling preferences with the optional convection deck. The King 1107 is available in Ultra, Parlor and Classic models. 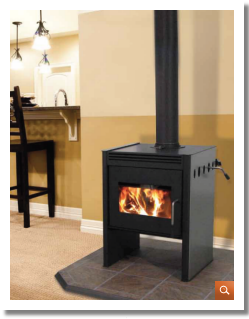 With a large fire box, this stove isn't just large but deep, providing safety, the ability to load up to 80 lbs of wood and reduce ash removal intervals. 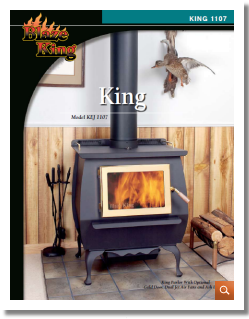 With an 8" flue and an honest to goodness thermostat, the King can burn up to 40 hrs on a low setting. Affordable and perfect for a small home as a supplemental heat source. Produces up to 39,000 Btus in a 1.73 cu. ft. fire box. Also features a 6" flue, solid one piece construction, and standard ash drawer. Burn wood up to 18 in length, and EPA emissions are 5.8 gr/hr. A large viewing glass door allows the fire to be seen from different angles in the room, creating an atmosphere of an open fireplace. 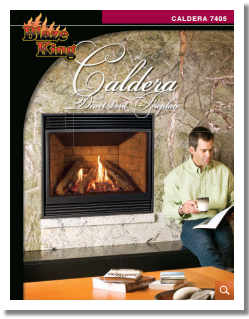 The warmth and beauty of the fire can be highlighted with the addition of the optional gold or satin plated door trim.